To improve accuracy, surface finish, safety, and communication capabilities for basic milling and turning machines, Sinumerik 808D Advanced offers up toÂ 5 axes/spindle motion control onÂ single machine channel. Drive bus communication occurs between CNC and drive forÂ maximum position control, andÂ data transfer isÂ supported over standard Ethernet protocol.Â Auto Servo Tuning (AST) lends to optimal surface quality and repeatable part accuracy in mold and die applications. The Sinumerik 808D Advanced offers up to five axes / spindle motion control on a single machine channel, with drive bus communication between the CNC and drive for better position control, data transfer over standard Ethernet protocol, plus Auto Servo Tuning (AST) for superior surface quality and repeatable part accuracy in mold and die applications. These include incremental encoder with 2,500 parts per revolution (ppr) or absolute encoder with 20-bit resolution. Motor speeds up to 4,000 rpm are offered with Safe Torque Off (STO) and IP65 enclosure protection. Vertical and horizontal configurations of the Sinumerik 808D are available to suit all standard control panels. 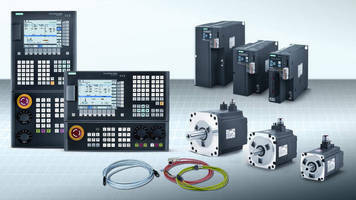 Siemens Industry, Inc. presents its new Sinumerik 808D Advanced CNC with compatible motors, drives and cabling, in vertical or horizontal variants for basic milling and turning machines. For more information, visit http://www.usa.siemens.com/industry.